I’ll mix and I’ll mingle the nouns and the verbs. 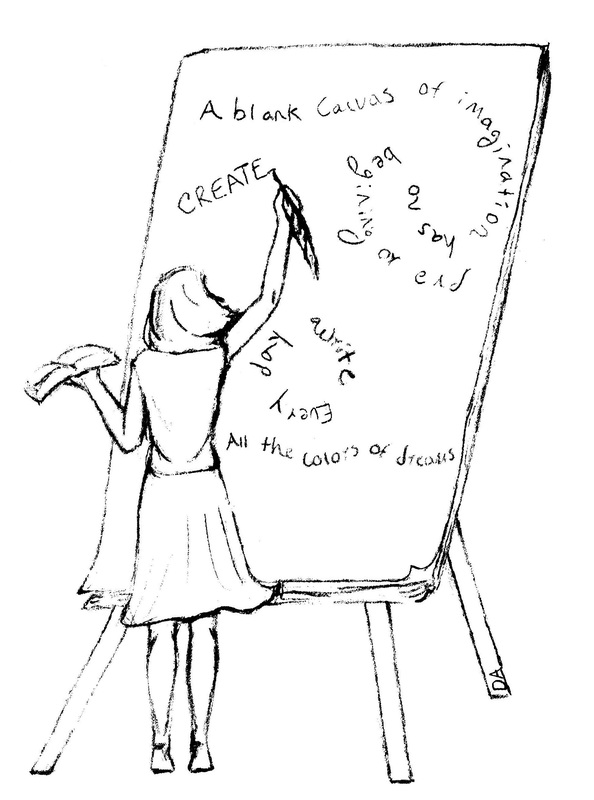 A blank canvas of imagination has no beginning or end. I’ll write you a picture with commas and feathers. A stroke of gray graphite mixed up with a wink. My pen is the paintbrush, my paint is the words. I’ll paint you a story you’ve never quite heard. This entry was posted in Writing + Stories and tagged Original Illustration, Poetry, Whimsy, Writing + Stories. Bookmark the permalink. aaaand, I would be proud to put this poem and your name in my writing class, can I have your permission for this? It will inspire my students, for sure! Hi! Thank you for your kind words and yes you are welcome to use the poem! Lovely words… I would also like to use this with my students if that is Ok with you. I will hang it in our class and give you credit… I always teach my students to give credit otherwise that is stealing! You really have captured what so many of us believe and feel about the creative process of exploring life and processing life as writers. Thanks for capturing it with such trademark originality here, Kari. Aww, the comment “trademark originality” totally made my day :] Thanks! Once again you have brought words to life, so beautiful!!! An amazing explination of the heart and motivation of a writer! Thanks so much for putting into words what so many of us feel. God bless! You guys are a great couple! Tell your hubby I love his style. Aww, thanks :] I will tell him! Thank you DAF and thanks for always stopping by and reading! Love the poem! Love the picture! How wonderful! May I use this poem with my students when I return to the classroom in a few weeks. I will, of course, give you credit. Of course you can :] Thanks for asking!